Museum » What Is a Trolleybus? A trolleybus is a normal-sized bus that is powered by electricity from a mains supply. It collects its electricity from two special overhead wires suspended above the road using a pair of poles (called “trolley booms”) mounted on the roof. 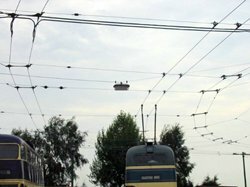 The principle is similar to that of the tram, but as trams run on rails, they return their electric current through their rails so do not need a second overhead wire and trolley boom. Like a motorbus, a trolleybus runs on rubber tyres on normal roads - but those roads need to be equipped with the necessary overhead wiring. 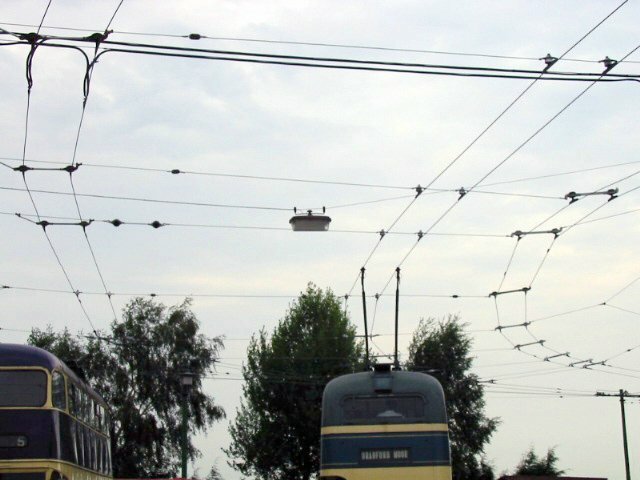 As trolleybuses are not confined to rails, they are more flexible than trams as they are able to steer away from the overhead wires by several feet to avoid parked or stationary vehicles and other obstructions, whereas trams run along a fixed line, unable to divert in any way. Some modern trolleybuses have an auxiliary means of providing traction power to allow operation away from the overhead wires, either utilising a small diesel generator or drawing on a bank of batteries. The trolleybus is quiet and vibration-free and thrives in many towns and cities worldwide. With zero emissions at the point of use, it must be one of the most environmentally friendly forms of transport ever invented.